Zombie Math Teacher: Silliness rules the day! I dedicate this post to my hubby on his 34th birthday. He is a major inspiration for my attitude in the classroom. Growing up, I was always silly and odd, and even a bit inappropriate. I always thought there was something wrong with me. Trying to fit into the cool crowd, as a gawky, gangly, goofy brainiac was a major worry in school, and I have vivid memories of how I failed at it. When I met my husband Chris, one of the things that I fell in love with the most, was watching a home movie of him doing karaoke in a whiny effeminate voice to "I'm With You" by Avril Lavigne. He swayed to the music in his Hawaiian shirt, shoved a buddy away from the mic when he tried to join in, and proudly belted out the "Yeah yeah yeah! yeah yeah! Yeah YEAH, YEAH YEAH YEAAAAAAAAAAH YEAH!!!!!!!!!!" ending in a screeching soprano voice. It was such an obnoxiously care free performance, that I thought, "I could really be myself with this guy, and he'd never call me a loser!" That song was later the first dance at our wedding, with a huge crowd belting out the tune as we danced. Ah, the memories. I started my first year teaching long before I met Chris, and I tried really hard to be firm with my discipline, strict and consistent with the way I ran the class, (meaning I talk, they take notes and study and regurgitate for tests) and I didn't make much effort to keep in touch with parents. I think if I remember correctly, I was borderline afraid of talking to parents about what their kids were (or weren't) doing in my classroom. Working in a remedial classroom setting, the news I needed to pass along was often bad news, and I felt way more responsibility for the students' lack of effort than I should have. Now beginning my fifth year teaching, I have lost all those pretenses. I am who I am, silliness and goofiness and zombieness all showing through proudly. I dance and sing and tell goofy stories about my kids, I shamelessly plug the latest young-adult fiction book I'm reading to students who might share my interests, and I state as many sarcastic comments and random movie & book quotes as I can fit into one class period. When it comes to subject matter, I look for the oddest, silliest, funniest, most original tidbits I can relate to a concept, doing anything I can to get a laugh. Are they laughing at me? Or with me? Who cares! I'm having fun and hopefully the students are too. Because laughter = endorphins = more memory retention. I stopped maturing when I was thirteen. So much for 13 going on 30! I am 30 (or maybe 31) going on 13. It's a great age to be! Go ahead, be somebody different today. Try out something new. Reinvent yourself. Change your attitude and your friends. Who cares what people think of you!? Normal is boring! 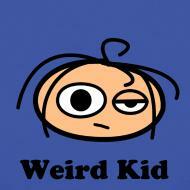 Weird is fun! And if you don't like something about me, just keep your mouth shut because I don't want to hear it. All of this I knew about myself, but having a caring and supportive husband who not only loves me for these weird characteristics, but embodies them himself, really helped me to see the value in it. As students pass through my door, I'm sure they think I'm odd. They may think I'm a zombie or a caffeine freak. But after they put all of this aside, I hope they see that their teacher knows who she is and what she is, and loves what she does. If I can inspire them to take a couple steps down their own road to self-discovery, my life is worthwhile. And maybe they'll learn some math along the way too.